SERVPRO of Downtown Charleston is available 24/7 365 days per year to handle your water, fire and mold emergencies. We continually train our team members on the latest industry restoration practices. We also have the equipment necessary to handle these emergencies. Call us any time at (843) 577-2470. We are always available and ready to go! 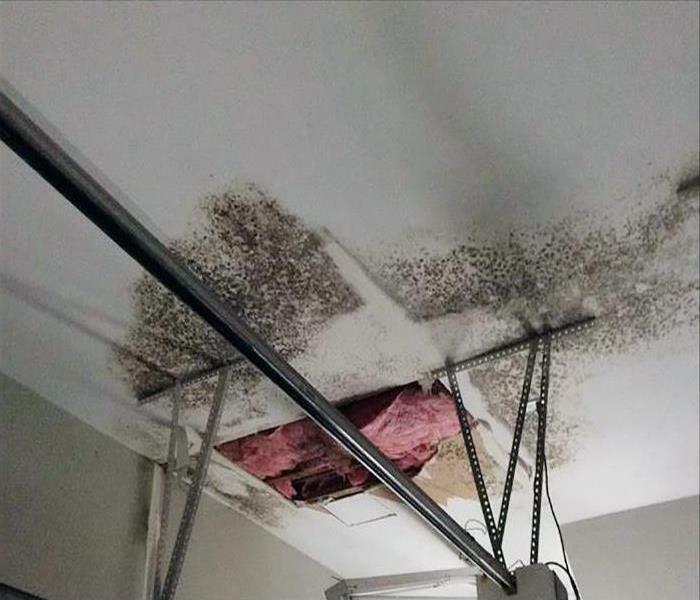 If water damage has affected your home, our SERVPRO team has got you covered! Our professional and IICRC certified technicians take pride in our work. 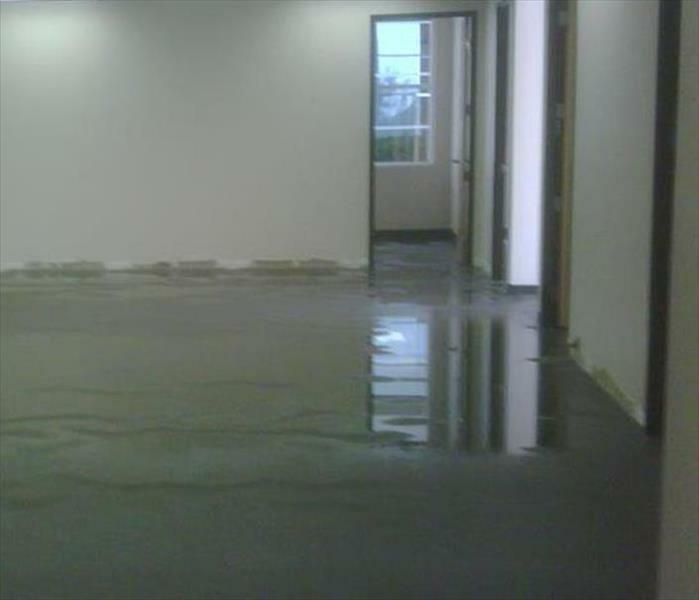 We make sure that the job is done right and that secondary problems related to the water damage are avoided. Contact our team right away at (843) 577-2470 if your home has suffered some water damage. 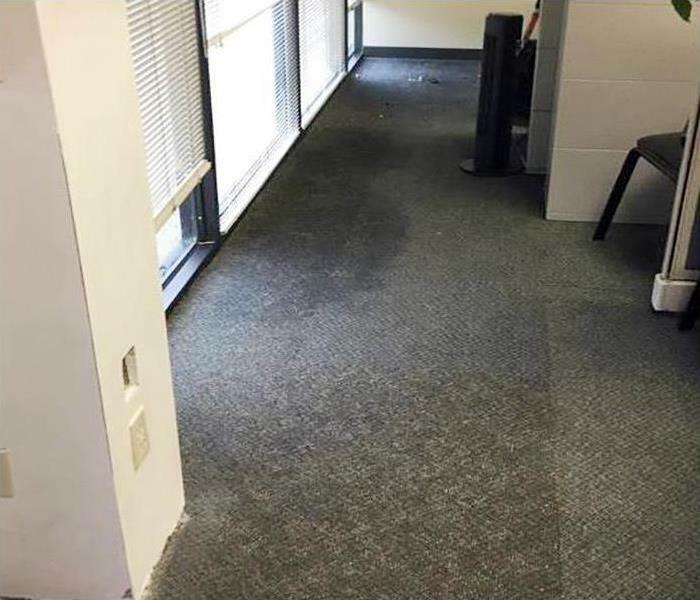 Flooding from a ruptured water line can necessitate the removal of all office furniture to a dry location during water removal and drying. SERVPRO can store and dry contents off-site to preserve their appearance and functionality. Meanwhile, we mitigate the water damage to reduce the need for replacement of items. 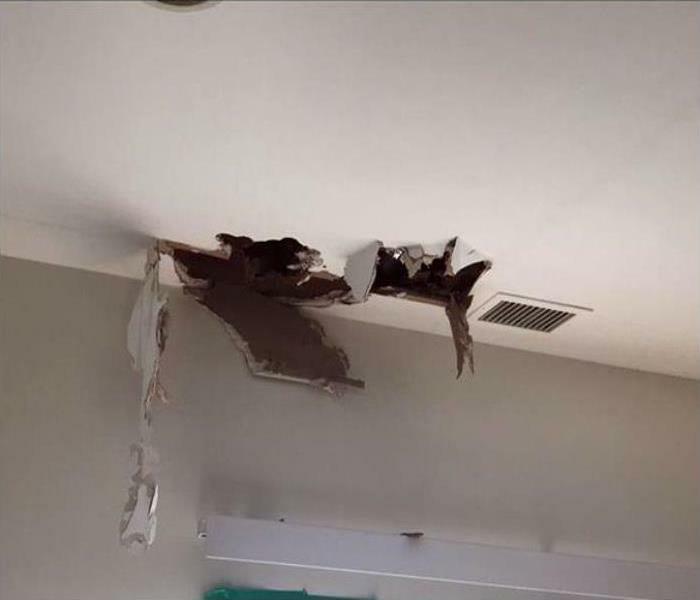 A homeowner called about a water damage emergency in Charleston. A bathroom sink caused significant water damage, and we needed to act fast. Our team arrived quickly and started our water damage restoration process. We worked quickly to restore this home to pre-damage condition. 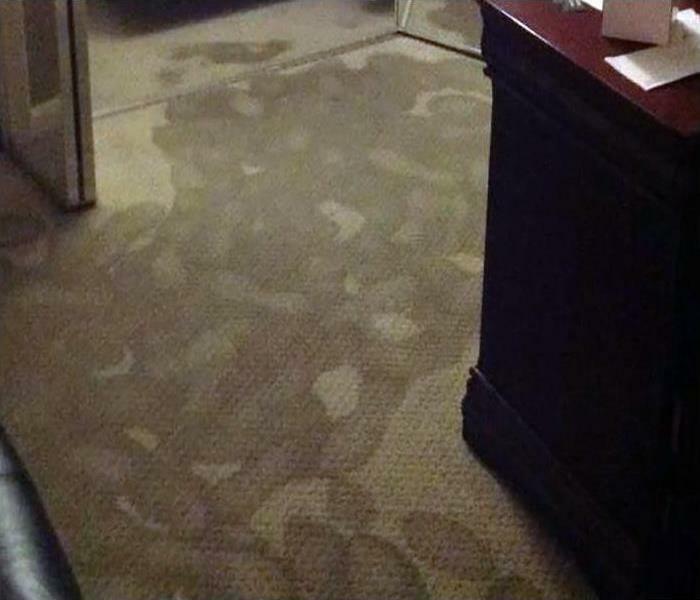 Don't let water damage control your life contact the team SERVPRO of Downtown Charleston for help! The mood in Downtown Charleston prior to the arrival of Hurricane Florence has been calm. Local businesses are preparing as tourist begin to evacuate. There are plenty of boarded buildings and sandbags to signal that the weather will soon become very dangerous. 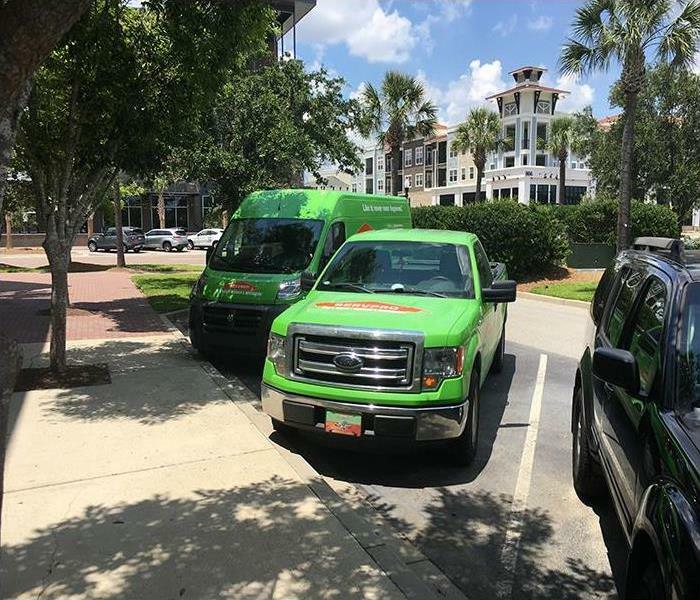 Our SERVPRO of Downtown Charleston team has experience restoring homes and businesses affected by storms and flooding. Most importantly, be safe and take precautions to protect your family. 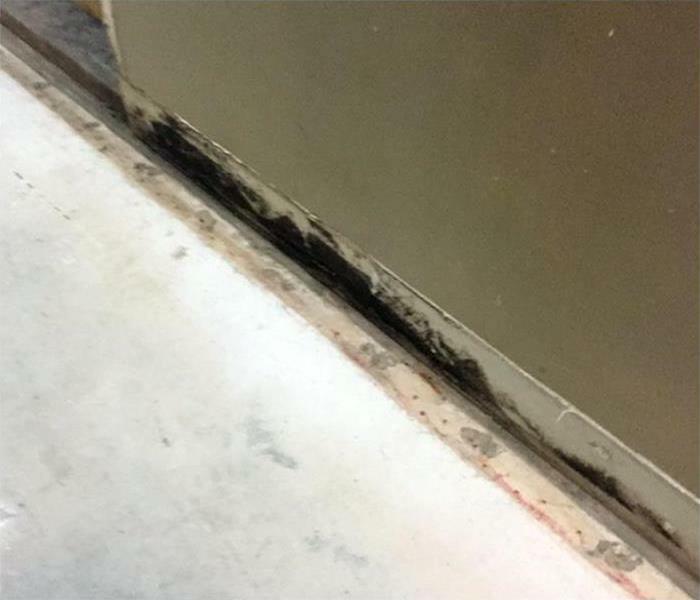 Water leakage often leads to mold damage in Charleston buildings. The now exposed walls and floor suggest a demolition by SERVPRO technicians is needed for mold remediation. Setting up a negative pressure area can help to keep the debris and spores from affecting other areas of the structure. The crew at SERVPRO of Downtown Charleston is ready to respond to your fire damage emergency. We have the equipment, experience, and training to restore your home to pre-damage condition. We are available 24/7, locally owned and operated, and Faster to Any Size Disaster. This fitness center in Downtown Charleston suffered a broken water main that flooded the floor. We're Faster To Any Size Disaster; so our SERVPRO technicians quickly arrived, vacuumed the pooling water from the surfaces and help stack and move the exercise equipment. We trailered in large desiccant dehumidifiers and set up the poly conduits for capturing and eliminating water vapor from the commercial building. By moving and removing large volumes of air and maintaining an ambient air temperature of about 80 degrees, we maximized the drying goals and minimized any chances of secondary water damage to the apparatuses. We offer skilled technicians and industry-leading equipment to grapple with water removal and dehumidification. Count on SERVPRO of Downtown Charleston to get your business back in business--quick. The bathroom sink supply line split at a fitting; the result was cascading water down from the vanity, through the second-story subfloor and insulation. The Johns Island homeowner called us, and we responded swiftly. The Photo depicts our SERVPRO technicians' work in progress. 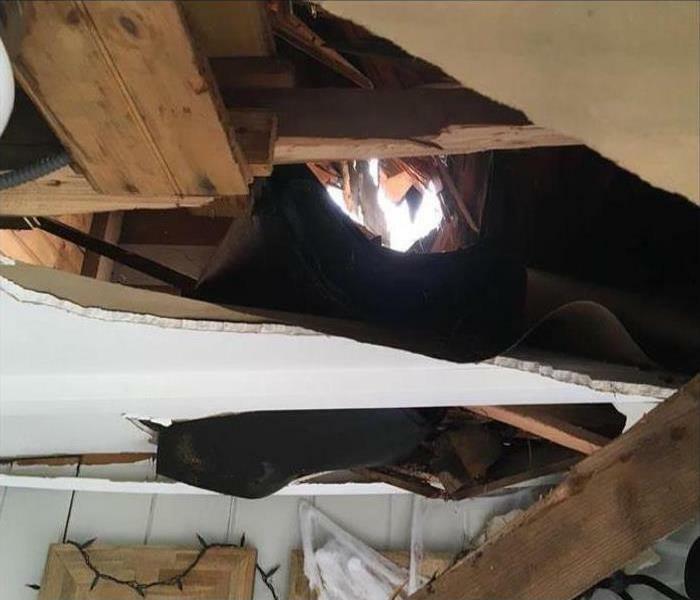 The soaked garage ceiling and walls below the bathroom were a hazard and non-salvageable. Our crew completed a controlled demolition and cleaned up and then turned to the drying process. By setting up a containment barrier erected with poles and 6-mil poly sheeting, we substantially limited the volume requiring drying. We positioned our air movers to maximize air movement and evaporation allowing the LRG dehumidifier to capture the water vapor. We monitored and moved the equipment to achieve our drying goal by the second day. Our customer was thrilled with the neat, professional service. Dealing with the damage caused by a storm can seem like a daunting task, but the team at SERVPRO has your back. We are ready 24/7, locally owned and operated, and Faster to Any Size Disaster. SERVPRO of Downtown Charleston has the experience, training, and equipment to restore your home to pre-damage condition. 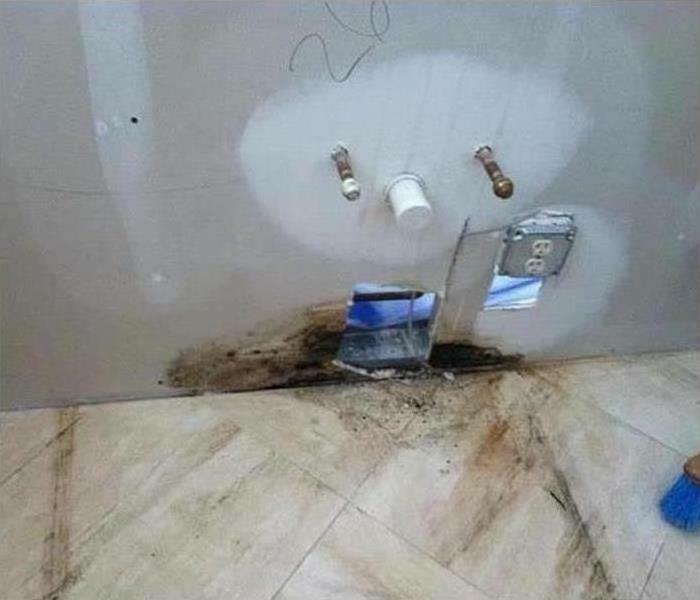 Mold damage in this Charlestown home’s bathroom was discovered during a remodeling project. 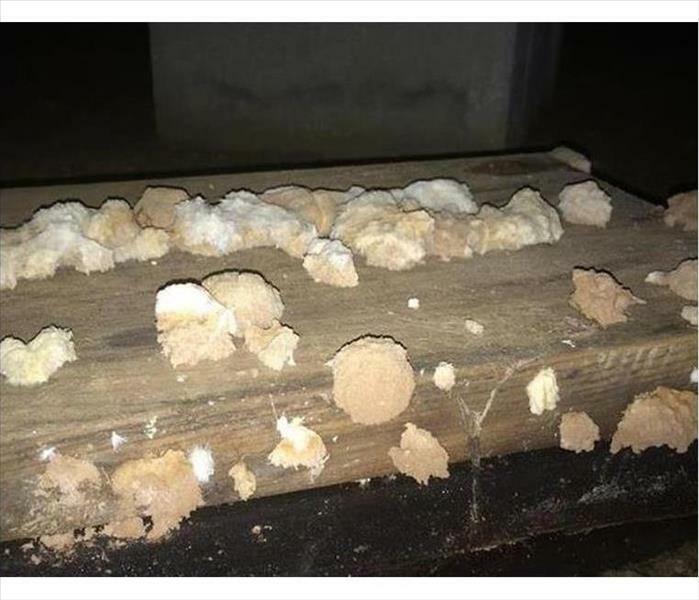 The remodeling contractor was not able to clean and treat the mold damage and recommended that the homeowners contact a professional mold damage restoration company to clean up the mold. 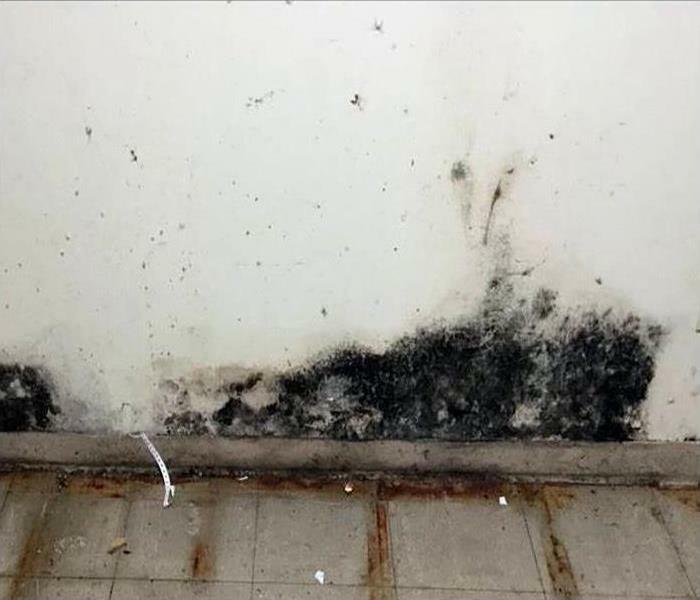 SERVPRO of Downtown Charleston could respond immediately with a trained and industry certified crew to take care of the mold damage so the construction could continue. A destructive fire like this one in the Charleston area leaves behind a complicated mess needing complete demolition and discarding. 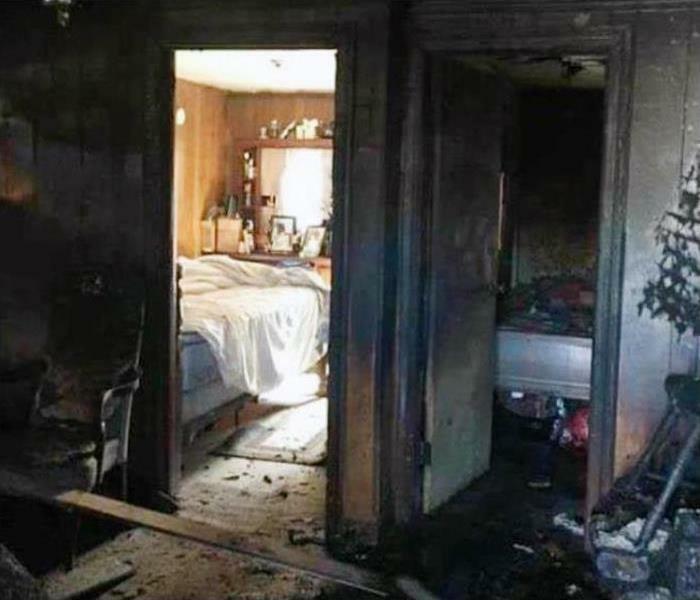 SERVPRO FST fire and smoke damage techs can arrive as soon as we get the okay from the fire marshall to begin the removal of the charred materials and building elements. That is the first step. When a storm strikes, the team at SERVPRO is ready and prepared 24/7 to assist you. Our storm damage specialists can handle any size disaster, and they are the best in the industry. SERVPRO of Downtown Charleston has the experience and equipment to restore your home to pre-damage condition. This large warehouse on Daniel Island suffered significant fire damage from a lightning strike. Fortunately, the stored inventory and equipment were not affected by the strike. 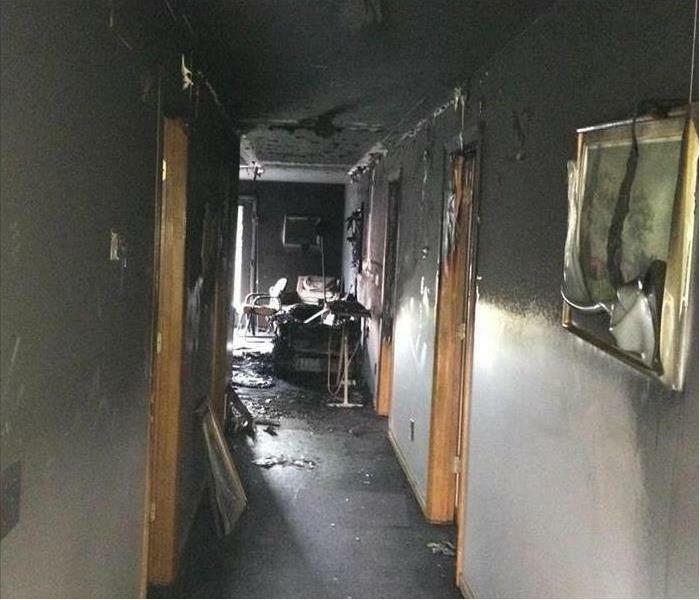 However, the office section underwent fire and water damage from the extinguishing efforts. SERVPRO teams immediately got to work with debris removal and building stabilization. The photo depicts fallen insulation and charred acoustical ceiling tiles. Safety first. Our fast response mitigated damages since we swiftly started the contents and facility cleaning. Our client was extremely impressed with the rapid progress leading to final restoration, "Like it never even happened." 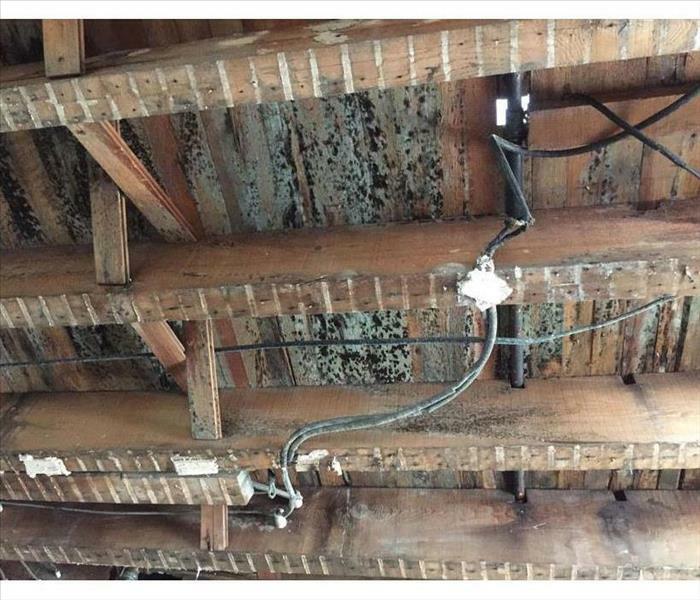 Moisture, poor circulation, plenty of beams and joists invite mold proliferation in Charleston area crawlspaces. SERVPRO can provide mold remediation by removing the visible patches with soda blasting or ice blasting and capturing the airborne particles with HEPA filtered air scrubbers. The oak floorboards can be salvaged with professional help. This distribution warehouse in the Downtown Charleston area was victimized by a broken water pipe. 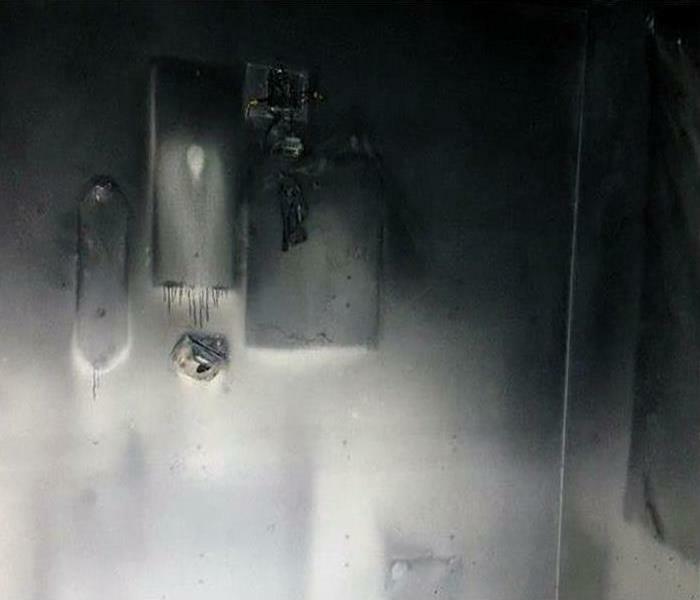 The commercial water damaging incident resulted from a forklift damaging a fire-suppressant sprinkler line. The 50,000 Sq. Ft. concrete pad, needed a rapid water extraction to mitigate damages to both the structure and the stored inventory. 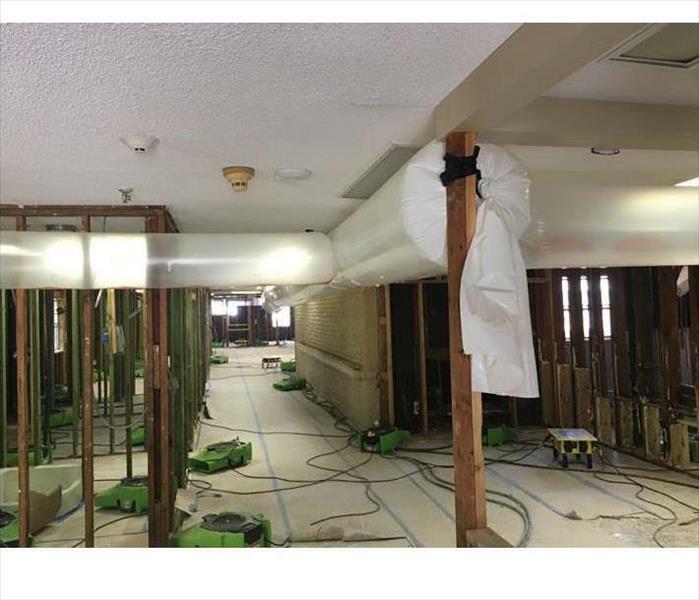 A goal of our SERVPRO of Downtown Charleston commercial water damage and restoration service is eliminating the water loss fast. As our truck-mounted extractors suction off the standing water, our crew is also readying dehumidification equipment. By capturing airborne moisture we decrease the drying time of the previously wet cartons from the sprinklers, salvaging the expensive boxed items. Our SERVPRO team members work long and hard to reduce adverse effects from this unforeseen flooding. Count on us to react and respond swiftly to your commercial water loss. The leak in this Downtown Charleston apartment building resulted in significant commercial water damage. The water cascaded from an upper level soaking several units in the verticle tower. The structural elements and personal items of the tenants faced degradation and ruin. 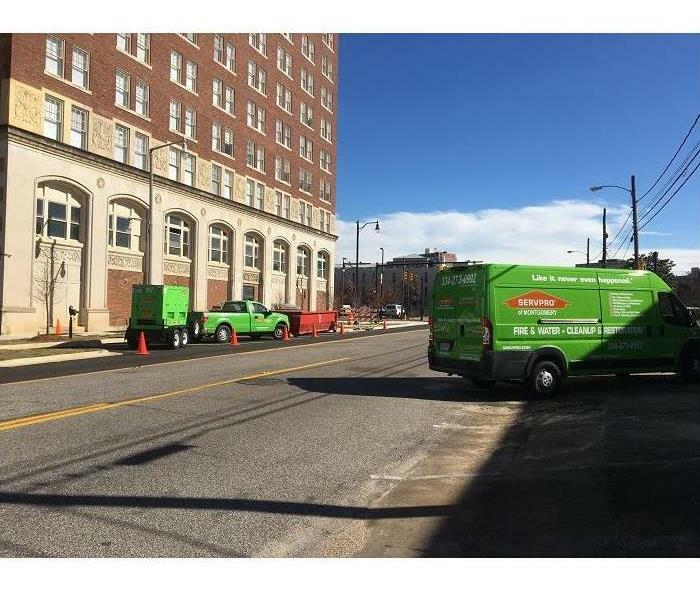 Our SERVPRO Green Fleet swiftly arrived to shuttle in equipment to begin limiting the water damage. These three Green Box-Trucks house just a portion of the water extractors, air movers, and dehumidifiers needed to mitigate the commercial water damage. With a dedication to professionalism in the water recovery industry, our sizable SERVPRO team began the water and moisture removal from the building. 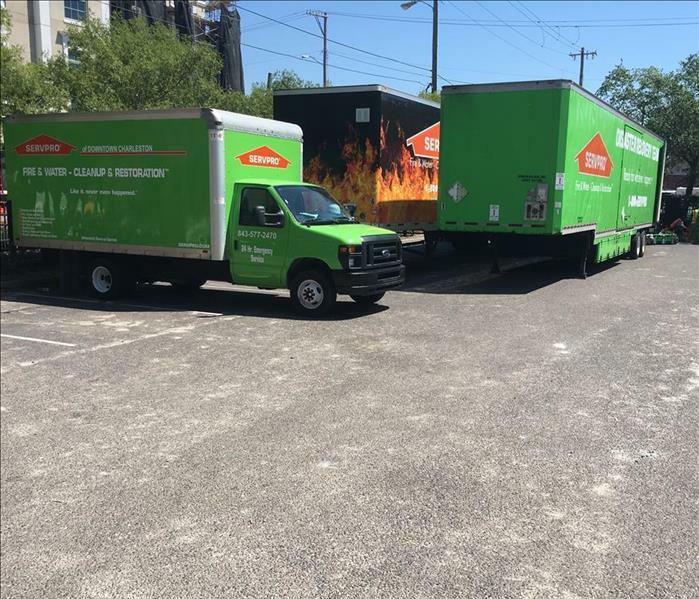 This extensive deployment of equipment and manpower gains a successful conclusion; this is why SERVPRO of Downtown Charleston is the go-to commercial water damage cleanup and restoration company. Our team was called out for a commercial water damage emergency on Meeting Street. Our team responded quickly and began the restoration process immediately. We were able to restore the area to pre-damage condition. We’re Faster to Any Size Disaster! Fire damage at this Charleston apartment left the ductwork covered with soot and smoke damage. 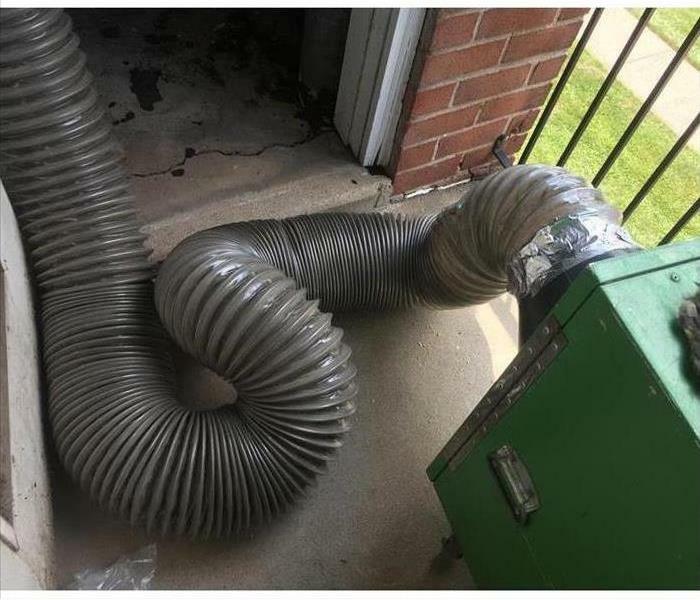 Duct cleaning for a commercial apartment complex calls for specialized equipment and staff that is specially trained to carry out this procedure. SERVPRO of Downtown Charleston has all the requirements to perform this project. Mold can cause significant problems for your business, and you need help from a professional restoration company like SERVPRO. Our crew of mold remediation specialists is highly trained, and IICRC certified. 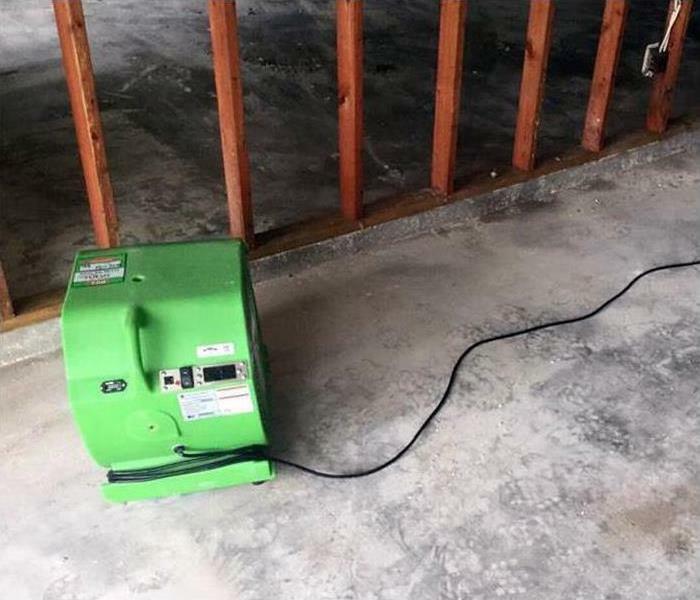 SERVPRO of Downtown Charleston has the experience and equipment to restore your business to pre-damage condition. 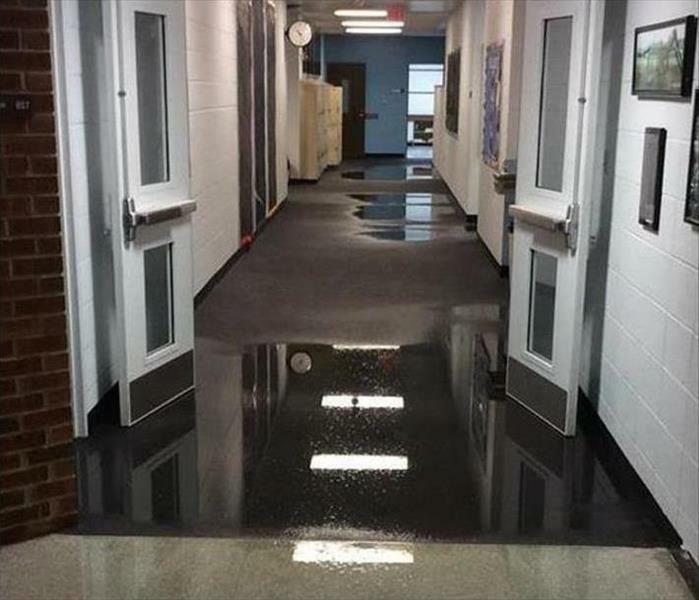 When water leaks from a line and floods the hardwood flooring of a commercial structure, often creative steps are taken. 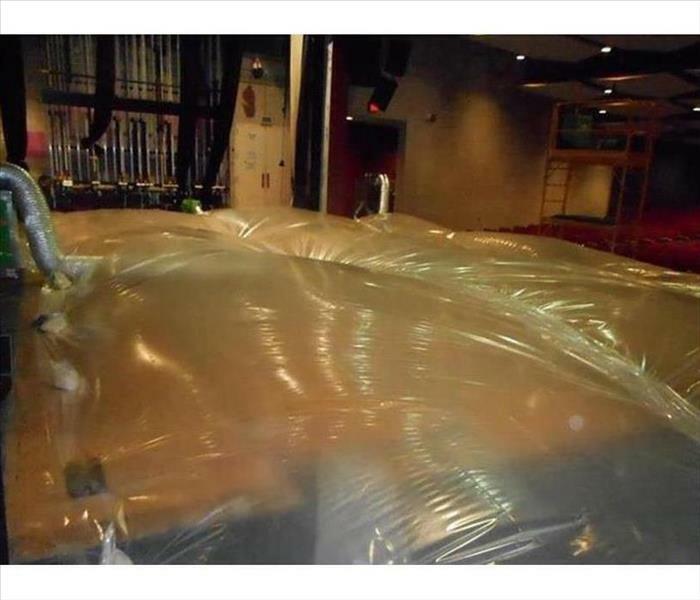 SERVPRO can mitigate the water damage and more swiftly extract the water and dry out the flooring with the use of "tenting." 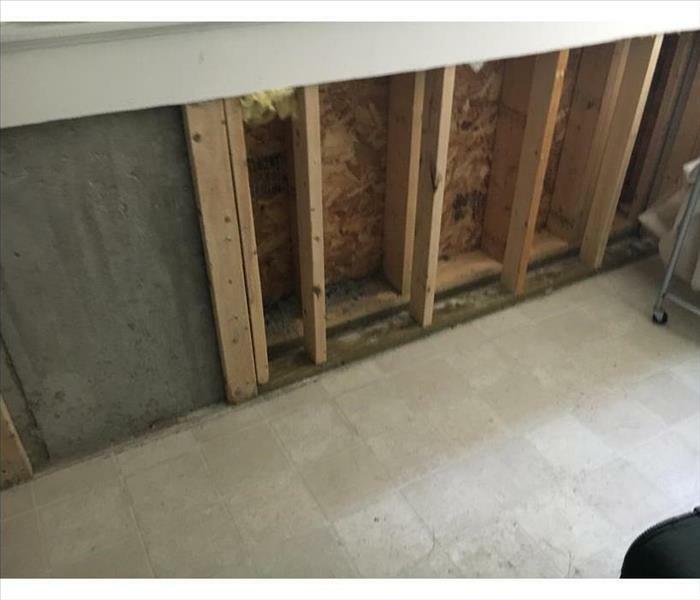 The flooding soaked into the lower walls of this Charleston home necessitating a controlled demolition to remove the non-salvageable building materials. SERVPRO techs work neat and clean, no mess to unaffected rooms of the house. 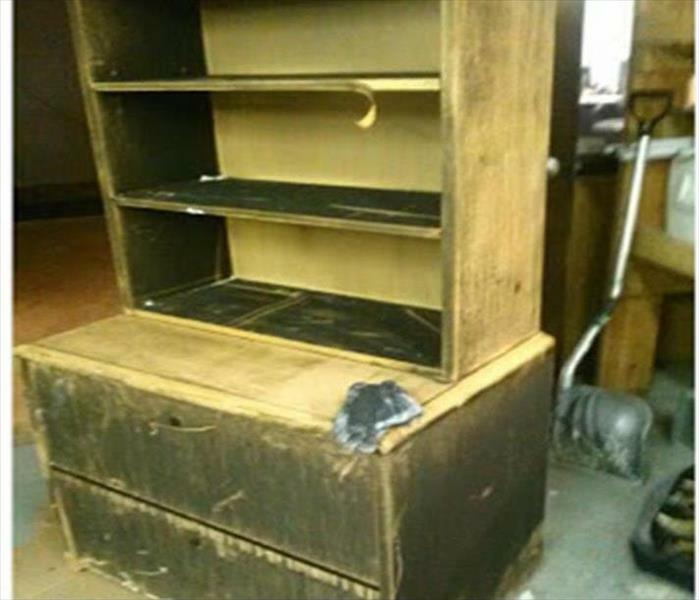 Even small fires can create problems needing professional cleaning like this bookcase/dresser from a Charleston home. SERVPRO can offer very skillful technicians, that use our formulated cleaning products, to wipe down, neutralize odors, and satisfy our customer with the safe and clean return of their cherished possessions. 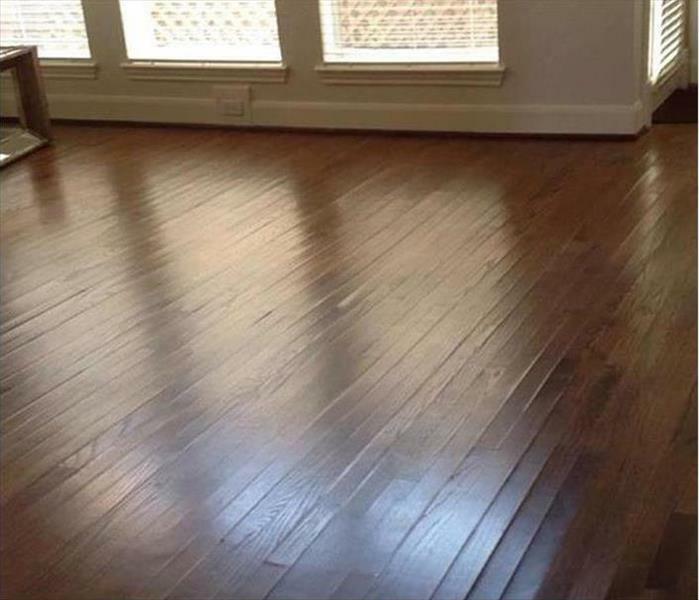 Water that covers hardwood boards in a Charleston home, if not removed within hours or a day, results in the cupping shown in this photo. SERVPRO responds promptly to achieve this water extraction during the window of opportunity to mitigate harm. We're Faster To Any Size Disaster. 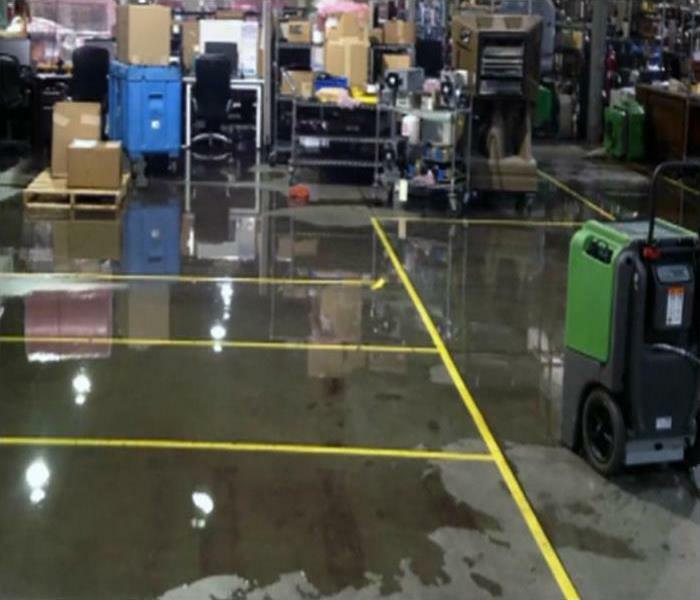 When your warehouse experiences a water damage emergency the one company to call is SERVPRO. Our restoration specialists will arrive quickly which will lower your restoration costs and limit the damage. SERVPRO of Downtown Charleston has the experience, equipment, and training needed to restore your commercial property to pre-damage condition. We’re Faster to Any Size Disaster! This commercial structure in Downtown Charleston suffered at the hands of a drenching rainstorm that left several inches of water on the floor. 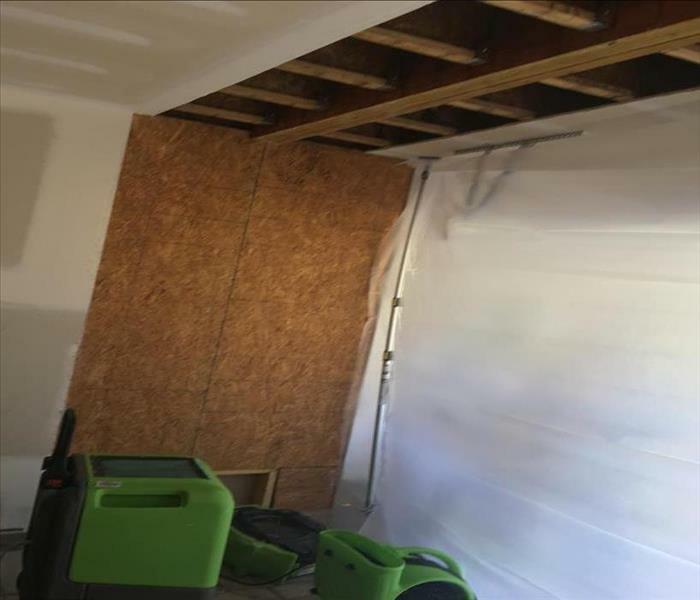 When SERVPRO ASD applied structural drying technicians scope the job site and then remove the water, you can be assured of a professionally done work-in-progress. 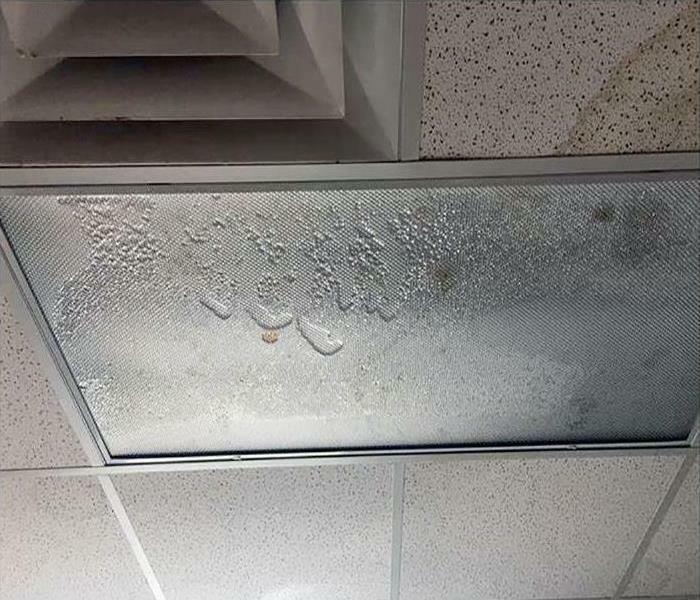 Attention to the humidity is crucial to prevent secondary water damage through on-going absorption into porous materials. The saturated sheetrock that was destroyed has been torn out and discarded. This also aids in reducing indoor moisture levels. Many air movers and dehus compliment the effort to secure a dry state for the final restoration before a rebuild can happen. Count on SERVPRO for a fast response and completion. Looking up and discovering your garage ceiling is covered in mold is a homeowner's worst nightmare. 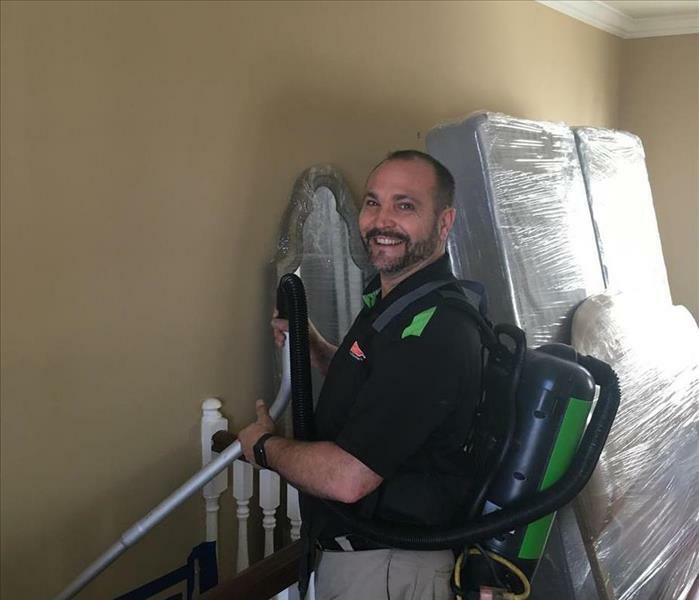 Our team at SERVPRO will work quickly and efficiently to eradicate the mold infestation quickly. We will use state-of-the-art mold remediation equipment to restore your home to pre-damage condition. 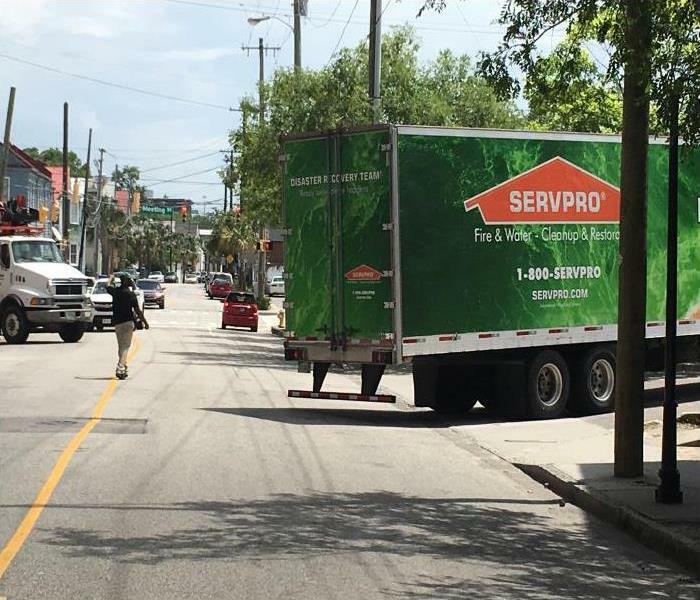 SERVPRO of Downtown Charleston is available 24/7, locally owned and operated, and Faster to Any Size Disaster! 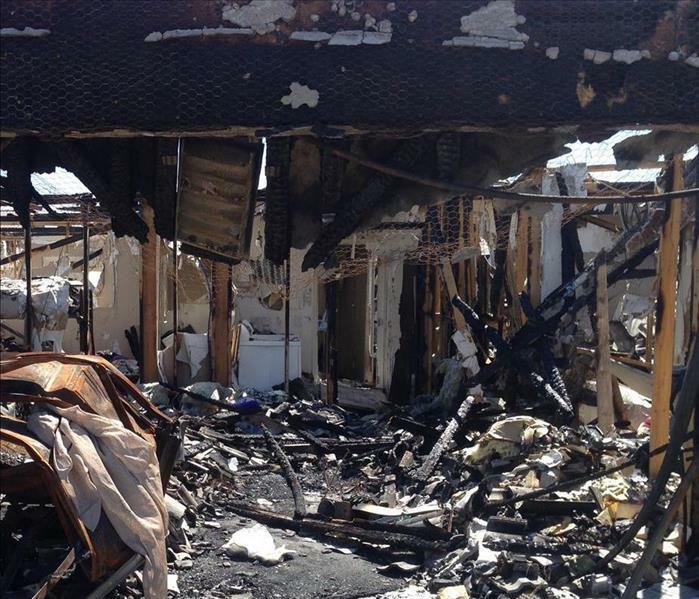 SERVPRO is the restoration company to contact when you have fire damage. Our fire restoration technicians are certified by the Institute of Inspection Cleaning and Restoration Certification in fire restoration, carpet and upholstery cleaning, and other cleaning and restoration courses. We will restore your property to pre-damage condition using state-of-the-art equipment and specialized cleaning techniques. SERVPRO of Downtown Charleston is available 24/7, locally owned and operated and a leader in the restoration industry. When commercial buildings in the Downtown Charleston suffer significant water damaging events, the proprietors often turn to SERVPRO. When we quickly arrive and remove the water the doors always stay open as shown in this photo. 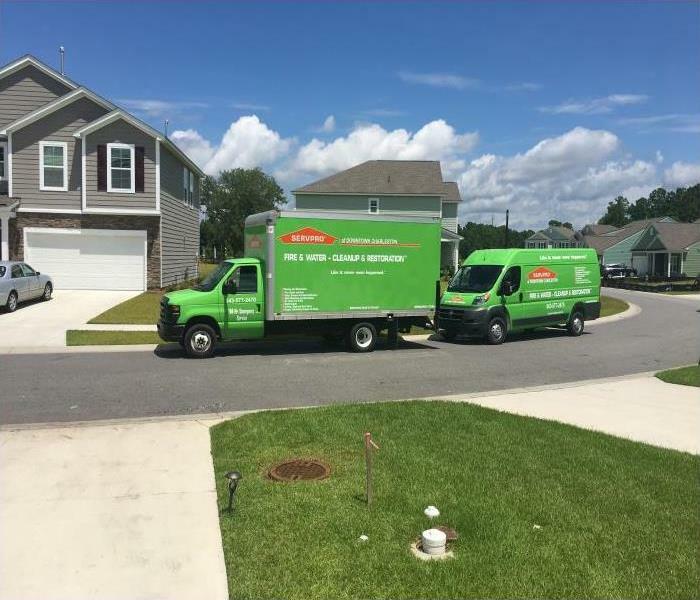 SERVPRO of Downtown Charleston is a leader in the restoration industry and has a team of trained and certified technicians. Storm damage requires immediate action, and that is why we provide 24-hour emergency service. We have the equipment, storm damage experience, and training to restore your residential or commercial property to pre-damage condition. The moisture in this crawlspace in a Charleston home was a favorable condition for large mold proliferation. 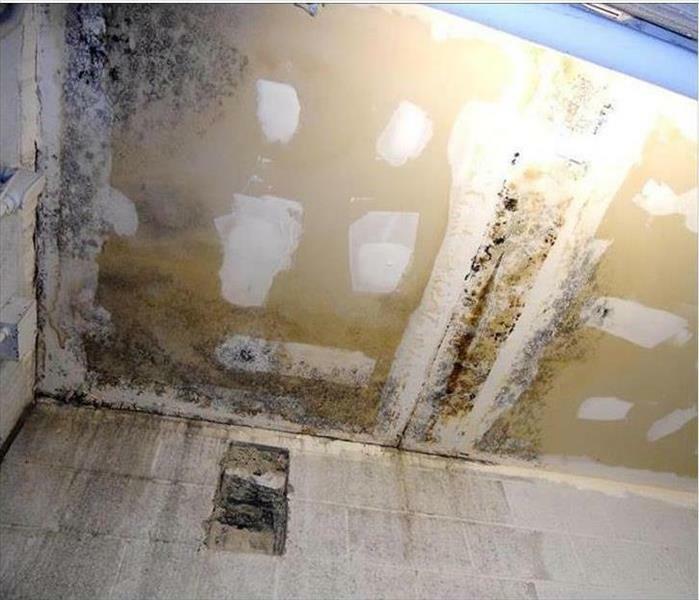 SERVPRO can remove the fungi without contaminating the living levels of this structure. Advice on controlling the humidity in this enclosed space is offered as part of a SERVPRO service. Often the water to extinguish the flames and the smoke from the fire caused most of the damage. SERVPRO crews can wipe away the stains and filter the air to make once again this house habitable. Rely on us for fast service. 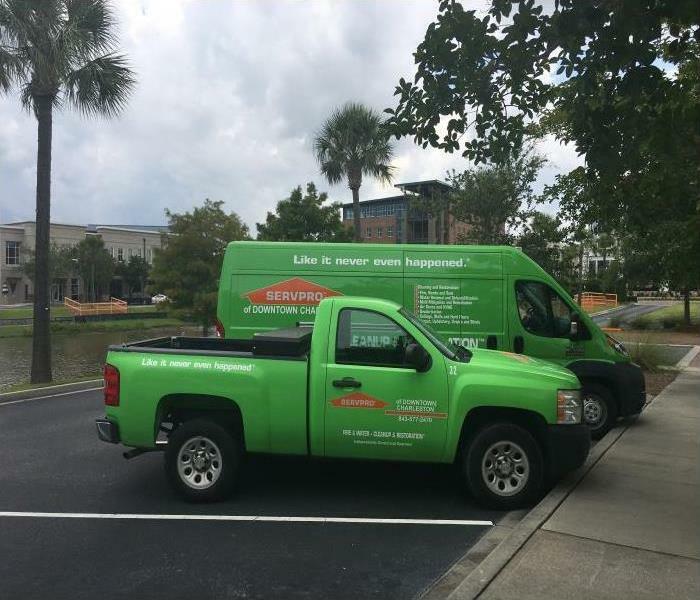 SERVPRO of Downtown Charleston has a team of water damage specialists that can provide a fast response time that can help to prevent mold and secondary damage. Our highly trained and certified experts will use water inspection, extraction, and drying equipment to restore your property to pre-damage condition. We are leaders in the water restoration industry, locally owned and operated, and Faster to Any Size Disaster!